First and foremost, I kept bringing up the fact that it has some very amusing characters. Machiavelli is in the second book, I loved that. There also is Billy the Kid, both of them were portrayed as villains. There was Shakespeare and Joan of Ark in it. They (thank goodness) were both good characters. Second I said that it has a lot of mythical creatures that are twisted in some way. As one of the main characters says "there is always a grain of truth in all myths". Scathach is a character in the books and she is a "vegetarian" vampire, who doesn't drink blood. Third of all I think that the plot is very interesting. It is about Sophie and Josh Newman who both are whisked away from their every-day lives and are told that they are "the twins of the prophesy". They don't know what that means. 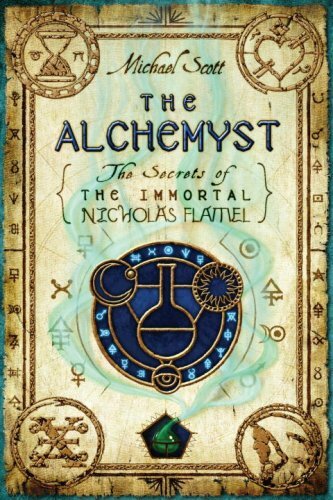 Fourth, I like the fact that he treats history, legend, and mythology the same way, like the fact that Nicholas Flamel gets treated the same way that the sphinx, and Shakespeare get treated. I want to read it! You gave it to some library!!!!! My family and I enjoyed this also (we listened to it on audio), but we haven't read or heard any of the rest of the series yet.